With tools such as WordPress, Tumblr and Posterous, you might think there are already enough ways to publish content online quickly and easily. Primal, which is launching at the DEMO conference this week, thinks that it has something extra to offer. The company’s semantic tools allow publishers to create an entire site of interrelated webpages around a topic simply by typing in a few keywords. Unfortunately, the site’s service could make the growing problem of low-quality content on the web worse rather than better. Publishers start with the service’s “thought networking” tools, says Sweeney, which involves typing in a series of keywords for a specific topic: for example, technology, social media, mobile, etc. The system then goes out to the web, aggregates content relating to those keywords from a variety of websites, and formats that information into a series of pages, complete with related Google (s goog) ads. The service’s agents create topic sections and other navigation as well, which Sweeney calls a “lattice of ideas or thoughts to frame your work.” Users can choose the content they want, add their own thoughts or images, then publish with a single click (content can be hosted at Primal for free with advertising included, or hosted at a user’s site for a monthly fee). Will Primal’s tools be useful for teachers who want to create course material sites, or small businesses who want to post useful information about their fields? Possibly. But I think they’ll also be very popular with web-spam artists. For all the company’s talk about “community,” there aren’t really any tools — such as comments or voting — that would allow for true community input. Primal is backed by a group of Waterloo, Ontario-based angels, including early RIM investor Jim Estell, and is looking to raise a $10 million round of financing. Thanks for the post, Mathew. We haven’t finalized the pricing structure for external publishers, but plan to offer tiered pricing so that organizations of any size can use the service. 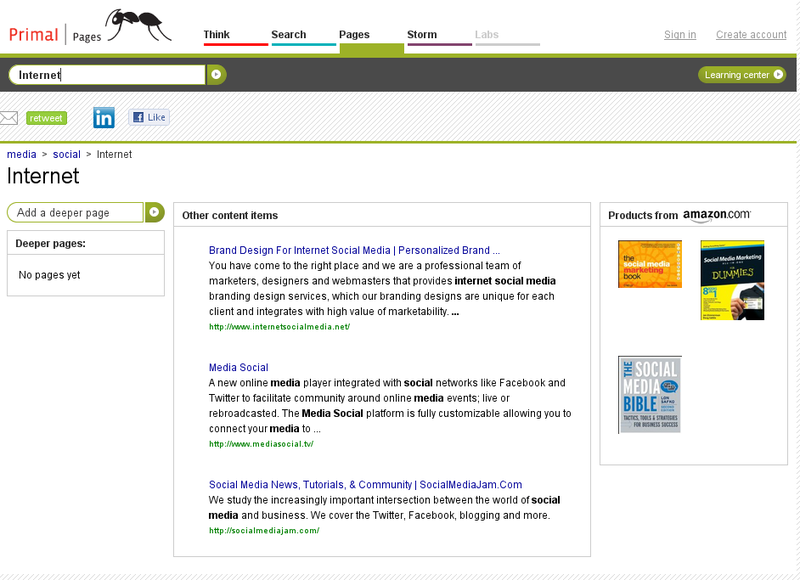 All of the Pages created on Primal are generated by the unique topics and clicks of the individual users. Immediately, our plan is to leverage the tools that already exist on the social web through our integration with Twitter and Facebook, with more to follow. We certainly want to guard against misuse. To our knowledge, there isn’t a way for spammers to inject content or otherwise game the system, but we’ll watch it closely. The defining aspect of our system is not that it’s automated, but rather that it’s consumer-driven. The intent is to provide the end-users of information with a new tool to express themselves using the information on the Web as their palette.